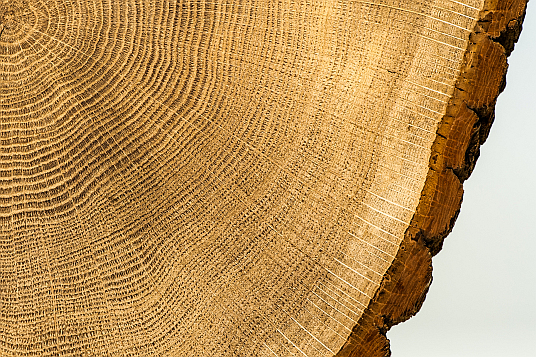 Dendrochronology as a scientific method for the dating of wood, depends on the fact that trees build annual rings which vary in shape from one year to another. Thus this array contains the ecological footprint of a trees whole life. Individual, locality-based factors as well as trans-regional climatological factors affect a trees increment rate; under good conditions a wide ring, under bad conditions a small ring is built. 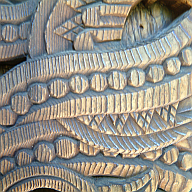 Thus a unique fingerprint develops for each tree. If a couple of individual chronologies from different trees are compared, it can be seen that trans-regional effects predominate. That's why a more or less distinctive, recurring characteristic pattern can be found with most trees. Even Leonardo da Vinci recognized these relations in the 16th century. The American astronomer A. E. Douglass invented the procedure of Dendrochronology at the end of the 19th century. In Germany the forest botanist Bruno Huber took up Dendrochronology in the 1940s. The development of ther first calendars for the region of southern Germany traces back to his scientific work. For the dating of a piece of timber in a construction it is essential that there is already a dated sample from the same region or the same climatic district available. For single samples show a high degree of individual growth it is not very useful to try to get a dating with only one sample for comparison. Although a dating with a single sample for comparison might be successful, only a tree ring calendar made from a high amount of samples -a regional calendar, based on arithmetic averages- provides a time series liberated of individual components. Thus dating becomes possible and reliable.